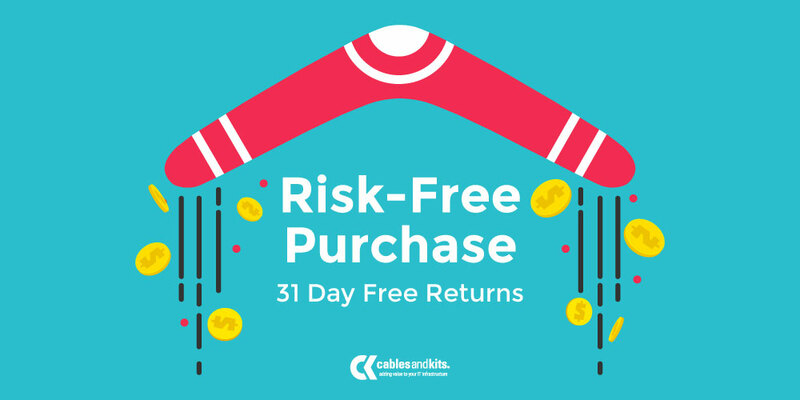 It means a Risk-Free purchasing and hassle-free return experience every time you order from CablesAndKits. Take the whole month to make sure your purchase was the right solution. Say goodbye to buyer's remorse for good! Any Reason Returns... ANY Reason! So you're not sure how much cabling you need for a massive project? No problem, just overestimate what you need and send back what you don't use. You just realized you ordered the wrong VOIP phones for your network. Don't fret, just send them back and we'll send the new ones out as soon as possible. You may return all or part of your order within 31 days for any reason for a full refund of the original purchase price. Return after 31 days will incur a 25% restocking fee. If the reason for your return is due to an error on our part, we will pay the return shipping costs and refund your original shipping charges; otherwise, you are responsible for the return shipping costs and the original shipping charges will be non-refundable. Related duties, taxes, and fees for shipments to and from locations outside the continental United States are the responsibility of the customer.